You are browsing the archive for 2007 September. ONE of TV’s most irritating programmes is “Click”. It usually crops up when you expect news and concerns itself with the geekier end of things computerish, or the needs of those whey-faced wannabes who claim not to be able to live without their Blackberrys. More than once in the hearing of your correspondent, Click’s cutting edge presenters have referred to events “way back in the 90s”. I wonder how old are Click’s younger viewers? Seven? It might have been our patron, Libby Purves, or perhaps Bill Tidy, who suggested that cartoons demand a certain level of knowledge, historical or otherwise, for them to raise a smile. Cartoonists aren’t just history buffs. Cartoonists are interested in everything. They have to be. That’s what the job’s about. Everything. Very little is beyond humour’s scope. Maybe that’s why cartoonists come from all sorts of other lives – education, science, banking, road mending, string manufacture – and why many are tolerably able in fields other than drawing folk with big hooters. So when the freelance cartoonist is commissioned to produce twelve sure-fire gags for a double glazing company – and companies are very keen on “product placement“ – then that freelancer had better be up to speed on all things transparent and still be able to make it funny. Is this really the future of print cartoons? Bloghorn offers a hat-tip to the Daily Cartoonist for a thoughtful analysis on the business issues around the future of commercial drawing. 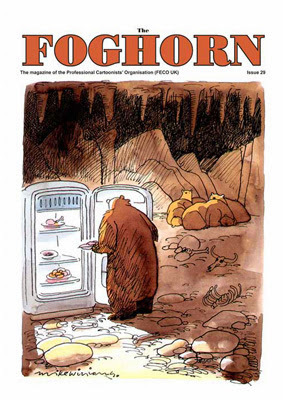 Complete in almost every respect, Foghorn, the magazine of professional cartoonists is soon to wing its way to the printers. Mike Williams* provides the cover for this issue. PCO member Royston Robertson reviews the third episode of Comics Britannia, broadcast on BBC Four 24th September 2007. THE final part of BBC Four’s Comics Britannia covered the period from the late 1970s when comics grew up. OK, maybe “grew up” is not the right phrase – especially as the programme opened with a look at Viz comic. Perhaps, “annoyed the grown-ups” is more appropriate, as this was when comics started to become grittier and more realistic, a world away from the Beano and the Dandy. This was made possible because Viz sprang not from the mainstream media but from the underground fanzine culture that sprang out of punk, and not from London but Newcastle. It was an authentic voice. Comedian Stewart Lee and others were called upon to read some of the Top Tips from the comic, laughter was mandatory. And with its non-PC characters such as Sid the Sexist and Millie Tant, Viz did not toe the line of the new politically correct comedy establishment. As Skinner commented, Viz “has a beautiful freedom about it”. Deftly pulling together some seemingly very different threads the programme moved on to Action comic which was around in the same late 70s period. The IPC comic was a very different animal to Viz, being a “serious” comic aimed at boys, but it was breaking similar taboos. It featured antiheroes rather than square-jawed heroes, and some quite violent storylines. Strips such as Look Out For Lefty, which covered football hooliganism and was a kind of dark twin to Roy of the Rovers, provoked the fury of the tabloid press. Action was withdrawn by IPC and later closed down. 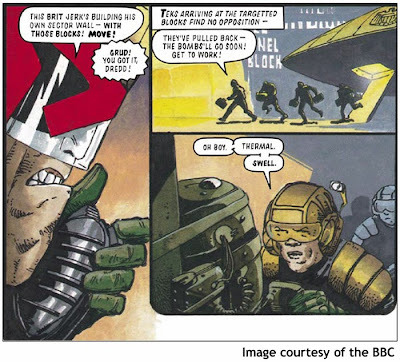 Pat Mills, the man behind Action and a key figure in British comics, pointed out that it was effectively relaunched under the cloak of science-fiction, as 2000AD. They found they could get away with violent and challenging stories that reflected contemporary Britain … if they were not set in contemporary Britain. Spanish artist Carlos Esquerra (who must have been a bit miffed to be given subtitles even though he was speaking English!) was on hand to draw Judge Dredd and talk about how his experience of growing up under Franco informed his depiction of the fascistic lawman. From 2000AD we moved on to the career of one of its writers, and one of the most significant players in comics: Alan Moore. It’s always a joy to see Moore on the telly, especially so soon after he popped up in Jonathan Ross’s BBC Four documentary about reclusive Spider-Man artist Steve Ditko. We looked at Moore’s V for Vendetta, created with David Lloyd, the story of Britain under a fascist dictatorship and inspired by the dark days of early 80s Thatcherism. We learned that it was very deliberately aimed at adults, with Moore and Lloyd eschewing Biff! Bang! Pow! sound effects and thought bubbles, and introducing a depth never before seen in comics. From this we moved on to the “British invasion” which saw UK comics writers and artists headhunted by the Americans. This led to the classic Watchmen, created by Moore and Dave Gibbons, which imagined what superheroes would be like in the real world (the answer: fascist nutcases). Moore’s reading of the Rorschach character was a joy, even if you had never imagined the creepy vigilante with a Northampton burr. The final part of Comics Britannia was a good overview of comics’ latter history, though there were some omissions. Where, for example, was Moore and Eddie Campbell’s epic From Hell? But sometimes it’s good to be left wanting more, or indeed wanting Moore. Someone should give that man his own chatshow. Bloghorn says thanks to the BBC for producing the series and also, to Royston for being the PCO’s first reviewer of cartoon culture. Click R for Robertson here. The PCO is fielding a team of crack professional cartoonists at this year’s Big Draw which takes place in London’s Covent Garden over the weekend of October 13th/14th. We will be running workshops over both days and competing in the battle of the cartoonists on Sunday afternoon.There are details here. The picture above shows PCO’ers Tim Harries, Andy Davey and Matt Buck hard at work in last year’s event. If you are a PCO member reading this and would like to help during the weekend, please click and contact the committee here. If you aren’t a member,just come along and enjoy yourself. Cartoonists can spend a lot of time arguing about the merits of how they do what they do. Some artists stick to traditional methods, some experiment and some try not to worry about it too much. In the spirit of the final theme, Bloghorn found this, which is posted above. The skill remains the same, just draw it. The art in the video is made by a US cartoonist called Meredith Gran, who draws a strip called Octopus Pie. THERE was a very different cast of characters for the second part of the Comics Britannia documentary, and not just on the page. Gone were the quiet, eccentric types such as Aardman’s Nick Park and poet Michael Rosen, who reminisced about The Beano and The Dandy last week, and in came journalist Max Hastings and comedian Frank Skinner to talk about real boys’ stuff … war and football! Just like in the comics the girls in the audience were given something to keep them quiet too, so cartoonist Posy Simmonds and writer Stella Duffy were there to talk about the stories of ballet, boys and boarding school. A Mel Gibson was on hand to talk about the days of inky fingers – she’s a “comics historian”, apparently. Again Comics Britannia took a no-nonsense, chronological approach to telling it’s story. It picked the launch of the Eagle in 1950 as a starting point. I was amazed to learn that Dan Dare – Pilot of the future, started out, like the Eagle’s creator Marcus Morris, as a man of the cloth. Not surprising really, as the comic was launched as a wholesome alternative to the imported American horror comics, such as Tales From the Crypt, that had been busy warping young minds at the time. The programme was packed with such nuggets of trivia. Who knew that Jacqueline “Tracy Beaker” Wilson was once a DC Thomson employee and that her name inspired a new comic/magazine aimed at girls? Jackie, of course. Or that a young Gerald Scarfe won a drawing competition in the Eagle, with David Hockney as runner-up? 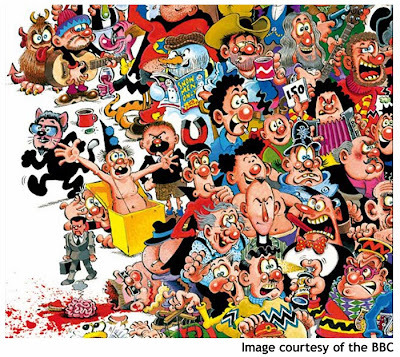 In fact, much of the documentary was a revelation to me because I spent my childhood immersed in humour comics, mainly The Beano, and didn’t bother much with sport and war comics. I was amazed to find that pop fops Spandau Ballet once played for Roy of the Rovers – though this explained the signing of Shakin’ Stevens in the Viz football spoof Billy the Fish (no doubt more on that in the final part of Comics Britannia next week). Likewise, I wasn’t too familiar with war characters such as Captain Hurricane. He was described here memorably by Frank Skinner as “a sort of muscular Duke of Edinburgh figure … a racist term for every occasion”. It was interesting to hear that Charley’s War, a later war strip which dropped the gung-ho approach (no more “Eat lead, Fritz!” caricatures) and attempted to cover the horror and futility of conflict, had been influenced by the real emotions found in the stories of girls’ struggles featured in Bunty and Tammy. Another enjoyable and shamelessly nostalgic romp through the comics, then, but with a hint of sadness. We’re told that 10 million comics a week were sold in 1973, but it’s made very clear: those days have gone.